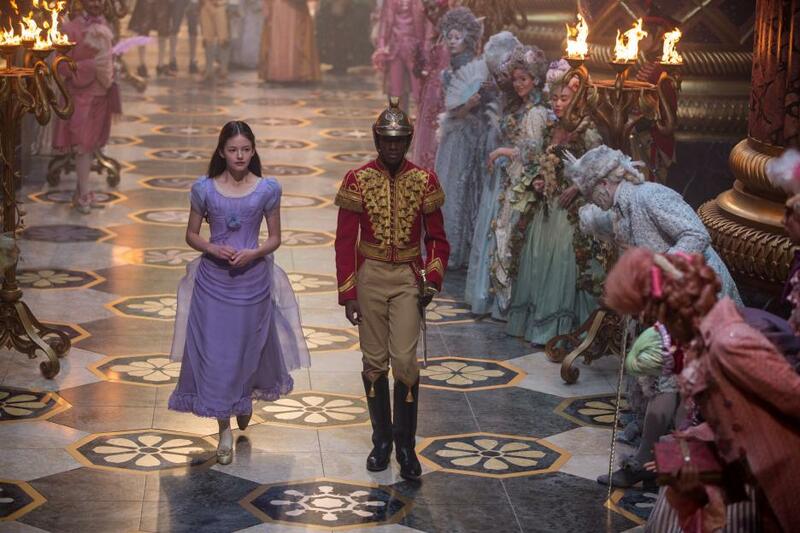 The new holiday offering “The Nutcracker and the Four Realms” may be an adaptation of an old story, but Disney wastes little time assuring us that Clara (Mackenzie Foy) is totally a modern girl. Right as the movie starts out, she is explaining the complicated mousetrap she's built to her little brother Fritz (Tom Sweet), using all the STEM principles the movie can squeeze in. But of course it's Christmas, so Clara is soon called to spend time with her family, who are all still grieving the death of Clara's mother. That sorrow has divided Clara and her father (Matthew Macfadyen), who is desperately trying to maintain the traditions Clara no longer feels invested in now that her family feels incomplete. Nevertheless, Clara is eager to attend the ball thrown by her godfather Drosselmeyer (Morgan Freeman), where she hopes to solve the mystery of her mother's final gift to her, a mysterious egg she is unable to open. The mystery only deepens when Clara finds herself in a magical world which just happens to contain many of Disney's trademarks. Clara quickly discovers this beautiful place, which is filled with colorful, toy and candy-themed characters, is at war with a mysterious land now called The Fourth Realm. She also discovers her mother was actually a skilled inventor who not only created this world, she brought many of its residents to life using a machine she invented. Her mother was also the queen of this realm, which makes Clara a princess. It's all a bit too familiar, and the rest of the movie doesn't offer much of anything original. The eye-popping colors and displays soon become routine, just another case of creativity being channeled into effects and costuming rather than the actual story. Even the spectacular cast, which includes Helen Mirren as the villain Mother Ginger who may not be as dastardly as she seems, ballerina Misty Copeland in a brief cameo that nevertheless stuns, Keira Knightley as Sugar Plum, and newcomer Jayden Fowora-Knight as a stalwart soldier who becomes Clara's friend and defender. However, even the best cast can't compensate for a plot that feels so recycled (especially when the actors who played Mr. Darcy and Elizabeth Bennet in 2005's “Pride and Prejudice” don't share any scenes, WTF?). Even when Clara stares in wonder at the Realms for the first time, it's reminiscent of a similar scene in “The Chronicles of Narnia” that was done far better. Even the things “The Nutcracker and the Four Realms” does right, such as making not only the main character, but its villain and secret heroine female, has been done before. The attempts to make Clara a more scientific-minded heroine also falls flat. In trying to make her someone who rejects the gender roles of her time, it unintentionally has her conforming to ours. Clara's interest comes with a certain tomboyishness, which is a stark contrast to her sister, who is the essence of femininity and firmly attuned to their father's struggles and hardships. She is even the one who fits seamlessly into the beautiful dress their deceased mother left her. For all its stated interest in empowerment, “The Nutcracker and the Four Realms” seems unable to comprehend that Clara could simultaneously have traditionally feminine interests as well as scientific ones. The lack of irony also extends to Clara's mother as well. She was apparently a scientific genius and inventor who not only created a world, but ruled over one. Yet she kept all her accomplishments a secret not only from the society she lived in, but her family as well. It says something that it took a fantastical realm for a female inventor to have the freedom to create, but the movie doesn't seem to comprehend this fact, let alone take time to explore it. But even that pales to the fact that “The Nutcracker and the Four Realms” completely fails to comprehend the biggest Christmas miracle of all: the fact that Clara's dress had pockets. Sometimes it takes a female director to appreciate such rare gifts.